for a free, no obligation instant quotation. 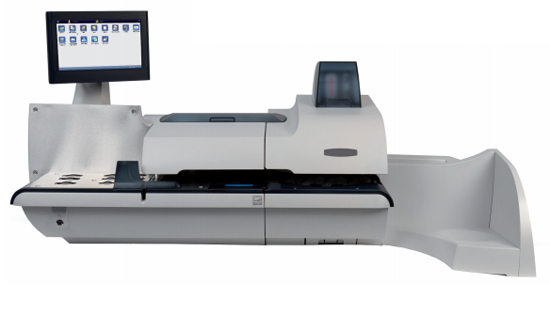 The Connect+ 1000 Digital Franking Machine provides a suite of applications that will ensure your mail is processed quickly and cost effectively. Save money by rate shopping for packaged and parcel shipments through your machine and understand your postage spend profile by accessing the suite of powerful inbuilt reports. This is valuable information that you don’t have to gather yourself and will help you stay ahead of your competitors. Make things simple to use and productivity soars. It’s a fact. That’s why the Connect+™ Series has best-in-class usability. Operators control everything from a full-colour 10.2" touch screen (15" available) with stylus. The home page has all the major functions grouped together to save time. The on-screen keyboard is faster than a conventional keyboard (you can connect a wireless keyboard if you prefer) and makes data entry and package tracking simple •You can save commonly used jobs so there’s no need to set them up over and over again. The Connect+™ Series offers you a rich source of information and the means to capture and manage it. When you know more, you can do more. Capture costs for accurate chargebacks by account, apply surcharges to recover costs or provide discounts. Provide rock-solid postage security with password protection and real-time account validation. Access financial and usage data remotely to identify savings, track spending against budgets and monitor mail centre performance by workstation, operator, or location. Export data via USB memory stick. This online service allows you to view and analyse data about your mailing activities. Monitor trends over time and compare behaviours of different client/departmental accounts. Identify opportunities for more efficient use of funds. Eliminate waste by identifying poor practice. The optional weighing platform handles parcels from 5kg to 35kg. Differential weighing means you can put several parcels on the scale at once: as you remove each one, the machine applies the correct postage. The power stacker can handle up to 600 pieces of mail in a single run, or 1,200 with the optional self-expanding backstop. Weigh-on-the-Way™ in-line weighing and Dimensions-on-the- Way™ in-line measuring gives you the confidence that you’re applying the correct postage to each and every piece of mail. Postage calculated automatically as items are processed. Up to 205 letters per minute. 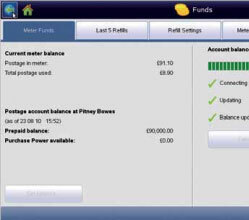 Your Connect+™ system allows you to maximise Royal Mail Cleanmail Advance discounts. Reporting shows you how many Cleanmail Advance items you send per day, by account, separately from the normal rate mail. Compare this to the data supplied by Royal Mail to gauge your success in complying with the Royal Mail’s rules. Use the difference to plan and take corrective action. 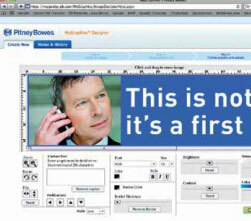 Another industry first from Pitney Bowes: full-colour in-line envelope printing. Print-shop quality promotional messages, graphics, postal indicia, mail permits and return addresses. Four-colour process (CMYK) or black inks available. Print everything all in one pass. Class-leading throughput speeds of up to 300 letters per minute ... Weigh-on-the-Way™ in-line weighing ... Dimensionson-> the-Way™ in-line rating: the Connect+™ Series delivers productivity improvements from day one. Every function is easily accessible to the operator from the highly intuitive colour touchscreen. The screen-based keyboard makes data entry fast and simple. On-screen help and e-chat provide instant support. The suite of apps makes light work of everyday tasks, from ordering ink to sending and tracking parcels. And you can visit websites like Royal Mail to complete admin tasks for mailings from your machine. Tasks are completed more quickly. Postage is applied more accurately. Information is managed more effectively. Direct marketers have always known the power of the envelope to increase response rates. Now you can apply that same marketing firepower to your everyday business mailings. Bills, invoices, statements: transform them all into dynamic opportunities to create a stronger relationship with your customers. What if you could print discount vouchers onto your envelopes? You can with the Connect+™ Series. How about time-sensitive messages to create a sense of urgency? Yes. Teasers to get your customer inside the envelope faster and primed to act? Easy. Graphical ads you design yourself that add impact and presence to your mailings? No problem. Whether you’re looking at costs or revenues, the Connect+™ Series make your job easier. The proven higher open-rates from colour overprinted envelopes mean a better return on promotional offers and customer mailings. You can even broker the ad space on your envelopes to create a whole new revenue stream. The Connect+™ Series offers robust yet straightforward costmanagement too. From postage security and parcel rate selection to cost charge-back and funds management, you can ensure you’re paying the right amount for postage and allocating it to the correct budget line, department or account. The Connect+™ Series lets you access all the major functions directly from the home screen. It’s a portal to software and services to get more from your mail. Now you can reap the rewards of turning your monthly transactional mail into promotional or revenue generating mail. The new Connect+™ 1000 and Connect+™ 2000 mailing systems can help any organisation turn its regular mailings into revenue generation tools.